Shoulder Specialist in Sarasota, one of first to repair subscapularis Rotator Cuff tears arthroscopically on a global level! Trained in the U.S. and in Switzerland, Dr. Bennett Was One of the First Surgeons to Perform Arthroscopic Subscapularis Repair Procedures. Dr. Bennett has been evaluating patients’ shoulders arthroscopically since 1995, after completing a shoulder fellowship in Switzerland in 1993 under the tutelage of world-renown Professor and Surgeon, Dr. Christian Gerber. 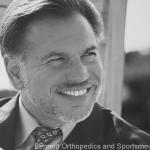 Dr. Gerber is presently-the head of Orthopedics at the Balgrist Clinic in Zurich, Switzerland. Following, his Fellowship, Dr. Bennett performed a Sportsmedicine Adult Knee and Shoulder fellowship in Los Angeles with Dr. Domenick Sisto of the Blazina Clinic. (The Blazina Clinic was named after Martin Blazina, one of the founders of Sportsmedicine in the United States). Classification of rotator cuff tears, pulley lesions, and outcomes studies have been performed right here in Sarasota by Dr. Bennett. He was one of the first surgeons performing arthroscopic subscapularis repair and one of the first to present his findings. He presented 2-year follow-up of arthroscopic subscapularis repairs at the ESSKA conference in Nice, France in 1998. Four (4) tendons make up the rotator cuff tendon system: the supraspinatus, the subscapularis, the infraspinatus and the teres minor. Dr. Bennett documented, as early as 2000, that the subscapularis tendon is involved in rotator cuff pathology at least 40 percent of the time. Since then, he discovered that upper subscapularis tears are even more prevalent, and that with subscapularis tears there is often a pulley lesion associated. These lesions can affect biceps tendon stability. 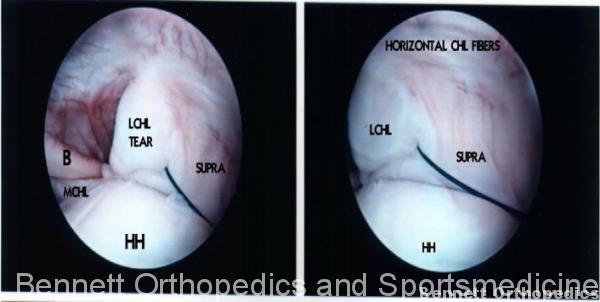 Many surgeons attempting to treat rotator cuff injuries do not repair of the subscapularis tendon. Dr. Bennett, with his advanced expertise as a leader in shoulder surgery, repairs the subscapularis tendon arthroscopically. Even sixteen years after Dr. Bennett’s discoveries, there are still surgeons who leave this tendon untreated. Patients have entrusted their shoulder care to Dr. Bennett of Bennett Orthopedics, recognizing that he is a pioneer in shoulder and knee procedures, and has extensive experience repairing injuries to enable athletes and other high performing patients to get back in the game. To read Dr. Bennett’s published study on this subject, click here to view. The arthroscopic repair of the isolated subscapularis tear provides for reliable expectations of improvement in function, particularly the use of the arm behind the back, decreases in pain, decreases in biceps subluxation or instability, and the return of active normal internal rotation. Subjectively, magnetic resonance arthrography is better than magnetic resonance imaging for visualizing the subscapularis tear. For years, Bennett Orthopedics and Sportsmedicine’s founder, Dr. William Bennett, has successfully treated partial thickness rotator cuff tendon tears without surgery. Dr. Bennett uses platelet rich plasma (“PRP”) injections to effectively treat tears of up to 50 percent thickness. Dr. Bennett owns a specialized ultrasound machine which allows him to visualize tears of the supraspinatus tendon to direct a needle with accuracy within one millimeter. This allows him to place the PRP injection with precision into the site of the tear. A rotator cuff tendon attaches muscle to bone. There are 4 muscles inside the shoulder that make up the rotator cuff. These include the supraspinatus, subscapularis, infraspinatus, and teres minor. Tendons form the cable from the muscle to the bone which allows us to move our skeleton. The muscle contracts and pulls along the tendon or cable and the bones move. The rotator cuff is the confluence of the 4 tendons. Tears can be complete or partial thickness. (Think of a braided wire or rope; when the wire or rope’s fibers start to fray but don’t fail completely, this is what a partial thickness tear is like.) When the tendon or cable completely detaches from the bone, this represents a complete tear. For tears of more than 50 percent thickness, surgery is often required. Dr. Bennett’s extensive experience and internationally recognized expertise in repairing all types of rotator cuff tears arthroscopically sets him apart from other orthopedic surgeons. Dr. Bennett has always used arthroscopy or minimally invasive repair techniques torepair all types of tears, even including massive tears and has never had to make a large or open incision! Numerous publications document Dr. Bennett’s high success rate in repairing these tears. He has noted that often partial thickness tears of the supraspinatus tendon and subscapularis tendon occur together. These lesions warrant the attention of an expert in shoulder surgeon because they lead to biceps tendon fraying. The arthroscopic repair of anterosuperior rotator cuff tears provides reliable expectation for improvement in function, decreases in pain, decreases in clinical findings of biceps subluxation and inflammation, improvement in shoulder scores, and the improvement of clinical findings of subscapularis insufficiency. Read more here. If you like to watch surgical procedures click on the following video to watch an arthroscopic rotator cuff repair for a massive torn tendon.